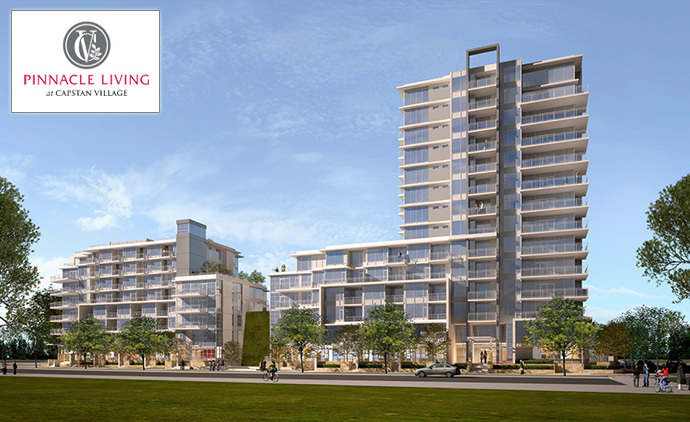 Pinnacle Living Capstan Village Richmond Condos > Phase 1 Launch! Close to outdoor recreation and within walking distance to some of Lower Mainland’s most impressive shopping and dining, Pinnacle International introduces the new Pinnacle Living at Capstan Village Richmond condo project. This is the Phase One release of this North Richmond real estate development that is quickly becoming one of the most prime and sought after neighbourhoods in the city. The project itself will feature close proximity to existing transit routes in addition to the newly proposed Canada Line Capstan Station extension that will get you anywhere in Richmond and YVR as well as to downtown Vancouver with ease. The presale Richmond Capstan Village condos at Pinnacle Living is all about living in the heart of one of the most multi-cultural and beautiful urban cities in the world and this iconic landmark master planned Pinnacle International development will be one of their flagship projects for 2013 and beyond. The new Pinnacle Living Capstan Village Richmond condo project is launching Phase 1 which will include the design and construction of an 8 storey mid-rise tower as well as a 14 storey high-rise with a terrace annex right at Capstan Way and Sexsmith Road Richmond BC. The new Richmond Capstan Village condos for sale will be part of a pedestrian and family friendly master planned community that will include new parks, a new hotel, office/retail space and condominium residences. Live in the centre of it all. Own a part of the future. These affordable Richmond Capstan Village condos are now previewing. Visit www.pinnacleinternational.ca for more information today! The towers are designed by world renowned Bingham & Hill Architects and the Phase 1 release will include an offering of approximately 200 deluxe condos and townhouses. The floor plans at the Pinnacle Living Capstan Village Richmond condos will include 1, 2 and 3 bedroom layouts. The towers will be concrete and built to LEED Silver standards. The building will have secured underground parking and extensive professionally designed landscaping. The homes will have air conditioning and heating for year round comfort in addition to 9 foot ceilings in most homes. Also, the Pinnacle Living Capstan Village condos in Richmond will have designer carpeting with laminate and porcelain tiled flooring. All homes have insuite Whirlpool appliances and custom stained wood suite entry doors. 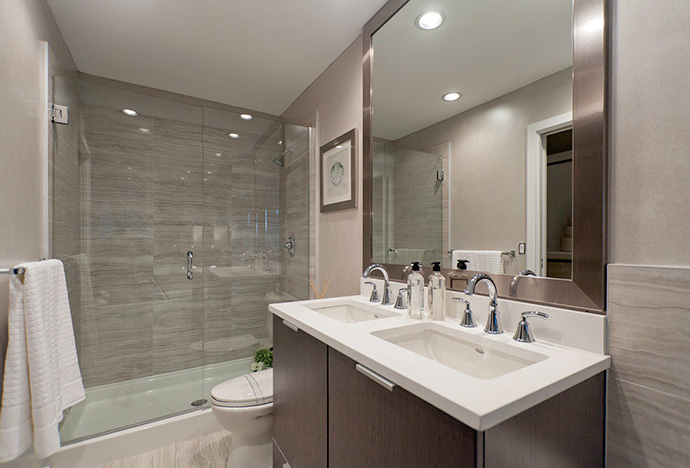 Here are some of the ensuite and bathroom features at the master planned Richmond Capstan Village real estate development by Pinnacle International developers. The bathrooms will have recessed pot lights as well as luxurious soaker tub with tiled surrounds and accents as per floor plan. In addition, the presale Richmond Capstan Village condos will have American Standard dual flush water conserving toilet and a stylish American Standard hardware set including accessories and a chrome faucet. Other bath features include a custom designed mirror and AmericanStandard under mounted sink in porcelain. The Capstan Village Richmond presale condos also have designer cabinetry custom built for your home in addition to designer vanities with marble or granite counters depending on your palette. Also there is large format Italian inspired porcelain tile work for the floors. 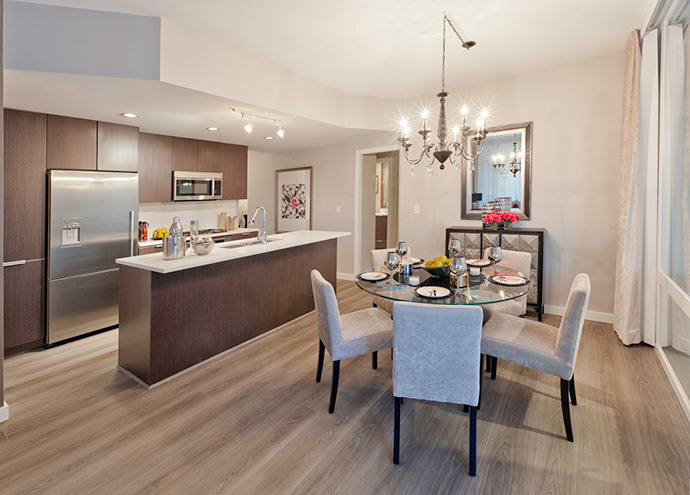 Here are some of the features for the spacious and functional kitchens at Capstan Village by Pinnacle International: contemporary recessed pot lighting as well as convenient in sink disposal unit. The Capstan Village Richmond presale condominiums also come with American Standard single faucet with integrated veggie pull out spray in addition to a set of Bosch appliances that includes a four burner gas cook top, built in wall oven, microwave oven, hood fan and a stainless steel dishwasher. The fridge with bottom mounted freezer is by Fisher Paykel and there will be laminate floors. The gourmet kitchens at the presale Richmond Capstan Village condominiums will also have granite counter surfaces in addition to designer cabinetry which has blumotion drawer and hinges for soft closing. The new Pinnacle Living Richmond real estate development will feature some impressive onsite amenity spaces that includes an indoor hot tub, indoor lap pool and a poolside lounge. 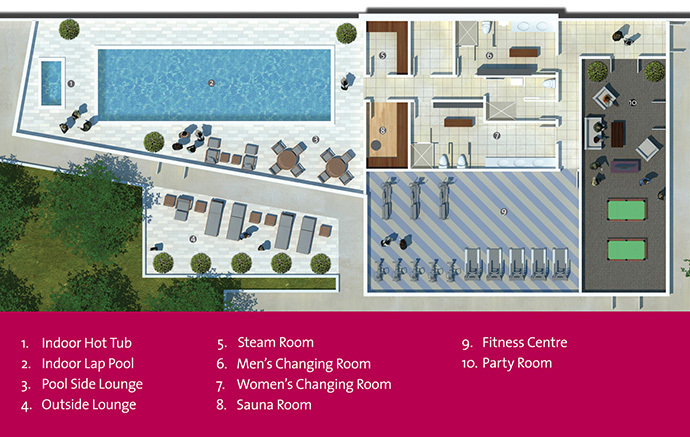 The Capstan Village amenities also includes an outside lounge area, a steam room and separate men’s and women’s change rooms. There is a party clubhouse which is great for entertaining guests in addition to a full fitness centre and a sauna room too. For families, there is a children’s play area on site. Part of the appeal of the master planned Richmond Capstan Village condo development is in its location that is situated close to YVR, the SkyTrain, Richmond amenities, shopping, dining, outdoor recreation as well as great schools. The project site is at 3220 No. 3 Road Richmond BC. Here’s a quick run down of some of the most popular Richmond Capstan Village condo floor plans. In Tower A Capstan Village condos includes Plan 1B1 which is a 1 bed and 1 bath unit at 525 square feet and 1D1 floorplan which is a 1 bedroom plus den and 1 bathroom unit at 580 square feet. Capstan Village Tower A Floor Plan 2B3 is a 2 bed and 2 bath unit at 810 square feet while 2D2 is a 2 bed/den suite at 885 sqft. The larger 3 bedroom and den plans 3D1 and 3D2 at Phase 1 Capstan Village Richmond condos are 1,100 and 1,040 square feet respectively. The presale Richmond Capstan Village townhouse TH1 floor plan is a 2 bed plus den townhome at 1,240 square feet. Tower B is the high-rise at Capstan Village Phase 1 and it features a few more floor plans that includes 1B1 which is 1bed/1bath at 525sf and 1D1 and 1D5 which are 1 bedroom plus den Richmond condo layouts at 580 and 600 square feet respectively. 2B2 and 2B3 are both 2 bed and 2 bathroom units in Tower B Capstan Village Richmond real estate development and they are 845 and 810 square footage. The larger 3 bedroom 3B1 floor plan is a spacious 1,115 square feet whilst the 3 bed+den plan 3D3 layout is 1,130 square feet. Phase 1 Tower B Capstan Village Townhouse floor plan TH1 is 1,240 sf while TH4 floorplan is 1,125 square feet.